We understand the unique health needs of cats. Since we are a “cat-only” practice, the veterinarian is able to focus exclusively on feline medicine when she attends veterinary conferences, participates in webinars, and reads professional journals. This combined with a 25+ year focus on feline-only medicine has enabled her to stay on top of the constantly changing advances in feline medicine and diagnostics. Per these results, we recommend a treatment plan or occasional referral to one of the many specialists who service Exclusively Cats Veterinary Hospital. If this seems overwhelming to you, don’t worry! We understand that each cat has only so many “kitty minutes” to give to his doctor and we understand that sick cats are often fragile cats (perhaps even grumpy cats). 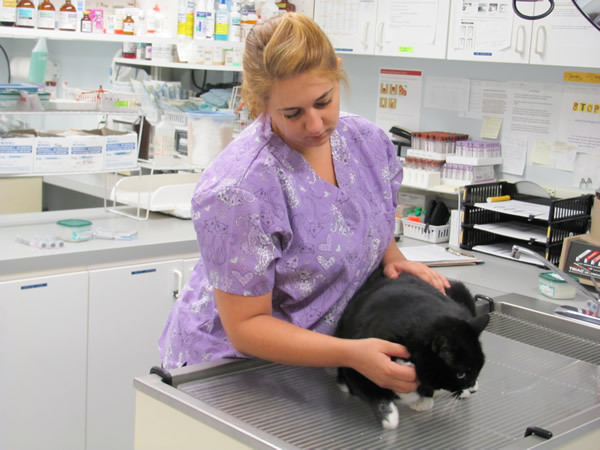 We work quickly and gently with each patient, prioritizing the order in which diagnostic tools are used so we can get a timely diagnosis without putting undue stress on your ailing cat! We also understand that the extent of diagnostic work should always depend on both you and your cat’s feelings on the matter, so we listen and try to help you find the best path to take to ensure your cat has a good quality of life. Cats are special not only in their great personalities, but also in their special handling needs, in the way that they show that they are ill, in the diseases that they get, and in the way that these problems are treated. 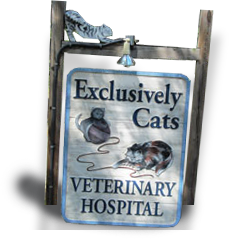 Here at Exclusively Cats Veterinary Hospital, we think “cat only,” so we are committed to doing our best to help our patients live long, happy lives with those whom they chose to live—us!